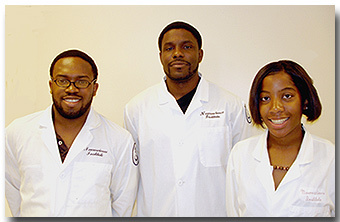 Morehouse School of Medicine Professor Ketema Paul (center), with two research assistants. Biographical Notes: Dr. Ketema Paul is Assistant Professor of Anatomy and Neurobiology at the Morehouse School of Medicine. His research explores the biological factors that impact sleep and wakefulness. Dr. Paul holds a B.S. in Biology from Howard University and a Ph.D. in Biology from Georgia State University.